We are huge fans of these vintage looking coffee table books from Graphic Image. 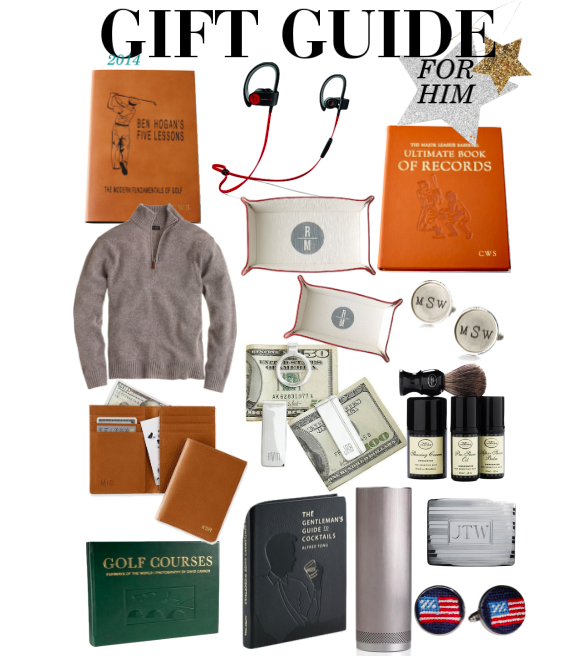 There's a huge variety of subject matters but our favorites are: Golf Courses, The Gentleman's Guide to Cocktails, The Modern Fundamentals of Golf, and MLB Ultimate Books of Records. One of the coolest things about these books is that you can get them personalized with your guy's initials! With it's sleek design and 360-degree sound, we think the Stelle Wireless Audio Pillar will be the perfect gift for any guy. It has great reviews, too! And for some more personalized gifts, how about this wallet, these cufflinks, belt buckle, these catchalls or this money clip. All of which can be personalized with initials. Everyone has seen the infamous Lebron James Powerbeats 2 commercial with Hozier "Take me to Church" playing in the background and the commercial had us sold right on the spot. These wireless, yes wireless, headphones are perfect for working out. My husband just got them for his birthday and is a huge fan. You can never go wrong with gifting some good old basics. This sweater is a favorite of ours. And we also love these goodies from Lululemon (not pictured):: pullover and boxer briefs. Both favorites of my husband.